Please do not plug the address into your GPS. You will end in at the wrong lot! Follow these directions. In-state parking is $4/car. Season passes can be purchased at the Blue Ball Barn. Take Exit 8B for Concord Pike (Rt. 202) toward West Chester. Stay in the right lane --- at fork, continuing toward DE-261 (Foulk Road) Turn right onto DE-261/Foulk Road. Turn right at the first light onto Weldin Road. DO NOT PARK IN THE CAN-DO LOTS C/D! Follow drive to circle, turning at the first right onto East Park Drive. Follow East Park Drive around to the NEXT right turn, which is immediately before the Rt. 202 overpass. This drive will take you to Lot B for the Alapocas Run State Park. From the field drive, turn right onto East Park Drive and then right onto West Park drive. Turn right at the light, following signs to Rt. 202 and I-95. Immediately after the Rt 202 and Rt 141 intersection at Astra Zeneca, bear right toward Augustine Cut-Off. You will be on West Park Drive. Continue straight through the traffic light. Shortly after passing the Blue Ball Barn on the left, you will come to a circle. Travel around the circle, turning right at the second right onto East Park Drive. East Park will take you under Rt. 202. Immediately after traveling under the Rt. 202 overpass, turn left onto the drive which will take you to the fields. At the circle, take your first right off of the circle onto East Park Drive.. East Park will take you under Rt. 202. Follow Rt 41 South, through Hockessin, bearing left after Sanford School onto Rt. 48. Turn left at the light onto Rt. 141 and continue. Eventually you will come to the Tyler McConnell bridge over the Brandywine River. After two lights, Rt. 141 winds to the right. Continue to light at Rt. 141 and W. Park Dr., turning right onto W. Park Drive. Go around the circle and take the second right onto E. Park Dr.
Travel under Rt. 202 and turn left onto the drive that will take you to the fields. From PA state line: Head southwest on Rt. 202, when you get to Naamans Road, Turn right onto Rt. 92 (Beaver Valley Rd). In 0.3 miles turn left to stay on Rt. 92. In 0.6 miles you will turn left onto Woodlawn Road and the entrance to Forbes Field will be on your left. Turn right at first traffic light onto Broom St. Pass Salesianum School and turn right at traffic light onto 18th St. Follow road as it winds around traveling under the RR tracks. Turn right at light onto Augustine Cut-Off. Travel up the hill and turn left at the first traffic light onto Alapocas Dr.
Continue on Alapocas Dr., passing Friends School on the right. Follow the signs for the Lower School. Turn left onto Granite Road bearing right to the Lower School. Park and walk up steps to field. Turn RIGHT onto Rt. 202. I-95 North and South entrances are immediately after you turn onto Rt. 202. Pass Astra Zeneca on your right (crossing the Rt. 141 intersection). Move to the right lane. Follow sign to Augustine Cut-Off, bearing right off of Rt. 202. Continue straight (around circle) to Augustine Cut-Off. Turn right onto Augustine Cut-Off. Turn right at first light onto Alapocas Dr.
Continue on Alapocas Dr., passing Friends School on the right. Turn left onto Edgewood Road bearing right to the Lower School. Park and walk up steps to field. From Wilmington, travel NW on Rt. 48, Lancaster Pike toward Hockessin. Pass Sanford School and bear left onto Old Lancaster Pike to School. Turn around if you pass Brackenville Road! From Pennsylvania, travel south on PA-41/Gap Newport Pike, crossing into Delaware. PA-41 becomes Lancaster DE-41. Travel 2.2 miles from DE/PA border, through the village of Hockessin. Continue past Brackenville Rd. intersection and turn right onto Old Lancaster Pike to Hockessin Montessori School. 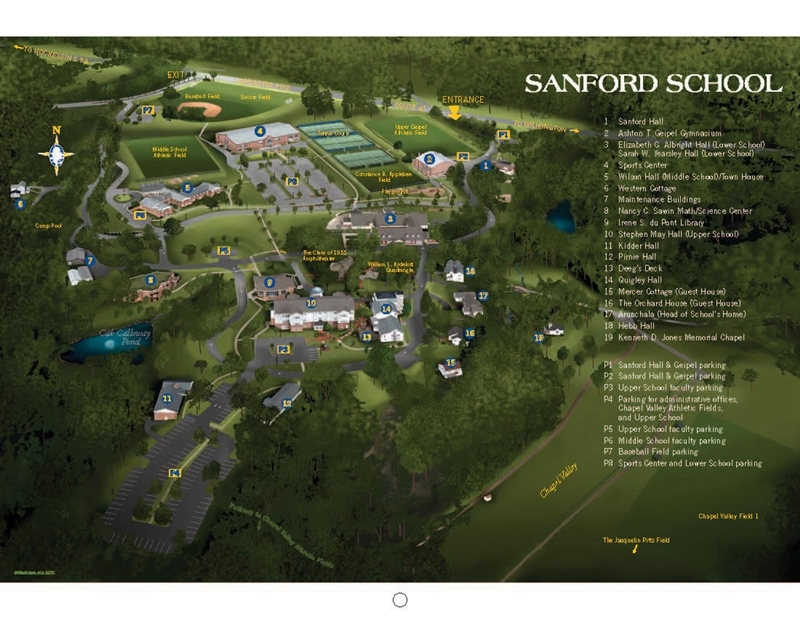 If you reach Sanford School, you have gone too far. Exit at Delaware Ave., Route 52. Turn right onto Delaware Ave.
Travel .2 miles bearing left onto Penna. Ave. (Rt. 52) Travel 2.5 miles, passing Tower Hill School and A.I. duPont Middle School. Exit onto Rt. 141 South. Travel .5 miles, turning right at next light onto Barley Mill Road. Immediately after turning right, the Barley Mill Road turns sharply to the right. Continue on Barley Mill Rd. for 1 mile. Turn left at main entrance to Tatnall School. Continue on drive to fields at back of school. Please park in the LOT! DO NOT PARK on the grass or along the drive. Continue on Route 141 for 1.8 miles, traveling down a big hill. Turn right at the light at the bottom of the hill, crossing over the Brandywine River. Continue on Route 141, through the Route 100 light at the top of the hill. Turn right at the next light onto Barley Mill Road. Immediately after turning right, the Barley Mill Road turns sharply to the right Continue on Barley Mill Rd. for 1 mile. Turn left at main entrance to Tatnall School. Continue on drive to fields at back of school. Please park in the LOT! DO NOT PARK on the grass or along the drive. Take U.S. 202 (Concord Pike) to Delaware 141 South to the Barley Mill Road exit (first traffic light after Delaware 52 exit). Turn right onto Barley Mill Road; proceed approximately one mile to the campus on your left. Â Drive straight back and fields will be ahead and to the left. Turn left at main entrance to Tatnall School. 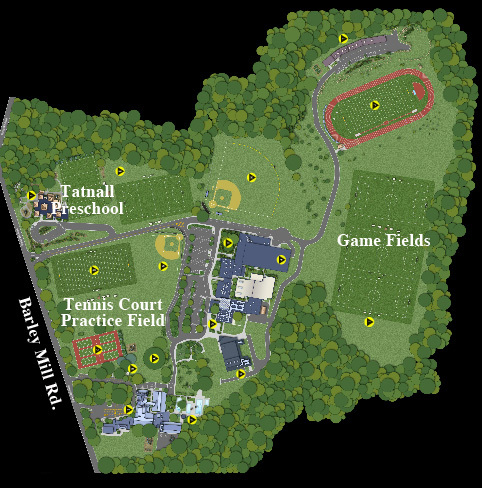 Make first right inside Tatnall, field is on your right, between the tennis courts and the football field. From I-95 North and South: Exit at Delaware Ave., Route 52. Turn right onto Delaware Ave. Travel .2 miles bearing left onto Penna. Ave. (Rt. 52) Travel 1.4 miles on Penna. Ave. Turn right onto Tower Road, immediately before footbridge. Continue on Tower Road for one block. Field is on the right. From Rt. 202 South: Turn right onto Route 141. Astra Zeneca is on the right. Fairfax Shopping is on left. Continue on Route 141 for 1.8 miles, traveling down a big hill. Turn right at the light at the bottom of the hill, crossing over the Brandywine River. Travel up the hill, turning left at the light onto Rt. 100. Turn left at the next light onto Rt. 52. Travel .9 miles, passing A.I. duPont MS on the left, to Tower Road,immediately after footbridge. Continue on Tower Road for one block. Field is on the right. From I-95 North and South Exit at Route 202 South. Turn right at first traffic light onto Broom St.Pass Salesianum School and turn right at traffic light onto 18th St. Follow road as it winds around traveling under the RR tracks. Turn right at light onto Augustine Cut-Off. 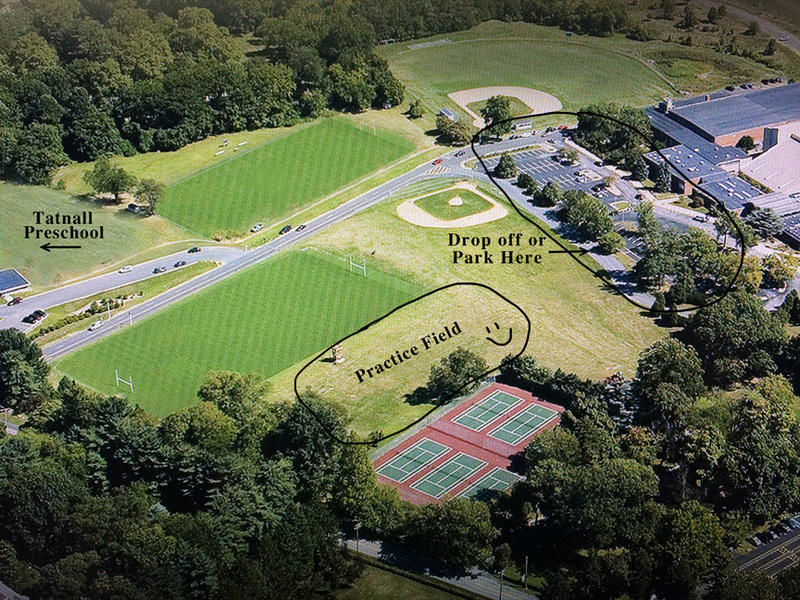 Travel up the hill and turn left at the first traffic light onto Alapocas Dr. Go through the stop sign at School Road and park in the Friends lot on the right and walk to the field. To return to I-95: turn LEFT onto Augustine Cut-Off. Turn RIGHT onto Rt. 202. I-95 North and South entrances are immediately after you turn onto Rt. 202. From Route 202 South on Route 202. After passing Astra Zeneca on your right and crossing the Rt. 141intersection, move to the right lane. Follow sign to Augustine Cut-Off, exiting on the right to connector. Continue straight (around 2 circles)to Augustine Cut-Off. Turn right onto Augustine Cut-Off. Turn right at first light onto Alapocas Dr. Continue to Edgewood Road, make right at the stop sign. Field is at the corner of Edgewod and Norris Roads. Off street parking available. From Route 52 South on Route 52. Pass the Greenville Shopping area and travel over Route 141. Turn left at the next traffic light onto Route 100. Turn right at the next traffic light onto Route 141 North. Continue on Route 141, traveling over the Brandywine River. Turn left at the traffic light (continuing on Route 141 North). At the next traffic light, turn right onto Alapocas Drive. Continue through Alapocas Woods. Make a left at the stop sign on Edgewood Rd. Field is at the corner of Edgewood and Norris Roads. Off street parking available.